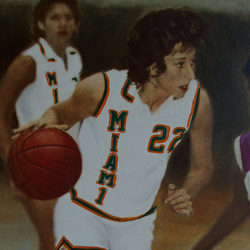 Robin Harmony is widely recognized as one of the greatest players in Miami women's basketball history. She finished her career with 1,308 points, 760 rebounds, 314 steals and 445 assists in 125 games. Harmony, who played from1980 to 1984, finished her career second all-time in all four categories. The 5-9 guard/forward is the only player in Hurricane men's or women's basketball history to record 1,000 points, 750 rebounds, 400 assists and 300 steals in their career. In her four seasons, Miami was 76-50, including a 24-15 record her freshman year of 1980-81. After graduation, the Hershey,Pa. native spent the 1984-85 season as a player/coach for the Avon Cosmetics Basketball Club of Northhampton, England. She returned to Miami as an assistant basketball coach in 1985 and was promoted in 1993 to associate head coach. In her 17 years under UM Hall of Fame coach Ferne Labati, she helped coach the Canes through some of its best seasons in history, including the 30 wins in the 1991-92 "Sweet Sixteen" season. Robin remained at Miami until she was named the first ever women's basketball coach at St. Thomas University in 2005.